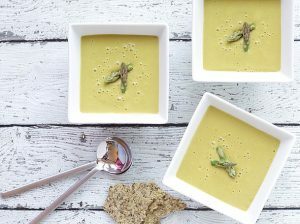 Spring is just around the corner and this fresh Asparagus Soup hits the spot! Asparagus is a nutrient-packed source of vitamins, minerals and essential proteins, and the star of this healthy dish. It’s rich in vitamin A, vitamin B1 (thiamine), vitamin B2 (riboflavin), vitamin B3 (niacin), vitamin B3 (pantothenic acid), vitamin B6, folate, vitamin C, vitamin E (alpha-tocopherol), and vitamin K (phylloquinone). The mineral treasures that are stored in asparagus include iron, calcium, phosphorous, magnesium, manganese, zinc, selenium, and potassium. One of the surprising ingredients in this all-star recipe, oatmeal, also contains boasts numerous health benefits, including supporting heart health, blood sugar control, a reduction in hypertension, cancer prevention, and increased immunity. People suffering from celiac disorder can generally consume a moderate amount of oats, since they are not wheat-based, despite having trace amounts of gluten. 1. In a medium pot, heat coconut oil over medium heat add the diced onion and cook, stirring often, until beginning to brown, 8 to 10 minutes. 2. Add garlic and cook for another 2 minutes. 3. Add asparagus pieces and salt and pepper to taste. Sauté, stirring frequently, for 5 minutes. 4. Add broth of your choice, rolled oats and bring to a boil. Cover the pot and simmer for 15 minutes until asparagus is very tender. 5. Puree the soup in your Vitamix or any other high power blender until smooth.